What is an "injury diary" and why should I keep one? So, you've been hurt at work and you are the kind of person who relies on their physical abilities for employment. You do heavy lifting, bending, rotating your shoulders, squatting, and all manner of physical labor. Suddenly you have been placed on work restrictions, and been referred to physical therapy to teach your body, once again, how to operate. You may be frustrated, confused, and wondering how you are going to provide for your family with a torn rotator cuff, or an injured cervical spine. With DC workers' comp it can be so easy to screw up your case simply because you don't know what your rights are, and you assume that the employer and the insurance company are going to take care of you. While this may, in some cases (not all) be true of your employer, they actually have very little influence over the insurance company. The idea that your employer is in charge of your workers' comp case is a very common mistaken belief, so I will say it again. They actually have very little influence over the insurance company. The insurance company is a third-party company, and their job is administrate your claim. If you are just getting started on your claim, it's best to heed this advice from the very start. If you have been working on your claim for awhile, it's never too late to get organized and be in charge of your case. 1). Keep track of your benefits checks. The insurance company will try and do try regularly to trip you up with respect to your benefits. If you don't know exactly how much you are expecting to receive on your check and when you are expecting to receive it, you run the risk of falling directly into their trap because they will use the lack of careful records as an opportunity to skip your payment. Your workers' comp rate (benefits rate) is calculated by the last 26 weeks you got paid (the average) and multiplied by 2/3. In other words, your benefits rate is 2/3 of what you were getting paid before. You can ask me for a sample of a payment tracking spreadsheet. I'm happy to send it to you - just email [email protected] with the subject line "Payment Tracking." You should be recording which dates are covered by the check, which day you expect to receive your check, and how much it should be. Also, keep your pay stubs in a file. If you are a client of ours and your check comes more than three days late, let us know right away. Three days late is an inconvenience but three weeks late is a crisis. Don't wait to let us know. If your check is more than 3 days late call us now to find out what we do about it. 2). Keep a diary of your appointments with your treating physician. Nobody knows better than you what your treating physician told you, and most times medical records don't tell the whole story. Do not let the nurse case manager into the room with you and your doctor. Every time you see your treating physician write down a)what he/she told you about your condition; b) what he/she told you about your prognosis; and c) how long he/she took you out of work. 3). Make sure you have a disability note if you are out of work and requesting your office visit notes from the front desk at the doctor's office. There is a significant difference between your disability note and your office visit notes, and you need both. The disability note (and all of your orders and referrals) tells how long you are out of work and what your doctor is requesting next for your treatment plan. The office visit notes, or progress notes, give a summary and overview of your visit and your treatment plan. If you have been keeping an appointment diary, we want to see that too. The more we know about your medical treatment, the better job we can do at being your advocate. Clients of ours have the benefit of our twenty years of experience in handling workers' comp claims. If you have a serious work injury, call us today at 202-393-3320. The last thing I would recommend, whether you are handling this on your own or have a workers comp attorney, is to draft a job description from the very beginning and bring it in to show your treating physician and remind him of the physical aspects of your job. Treating physicians see many patients during the day and may not remember the physicality of your job from month to month. Bring your job description with you every month, so that he or she can properly and accurately give you restrictions. If you are feeling overwhelmed, and have a significant work injury give us a call today. All we do is help people with serious, life changing injuries, and if you call us today at 202-393-3320 you will speak with a real person who wants to hear your story. 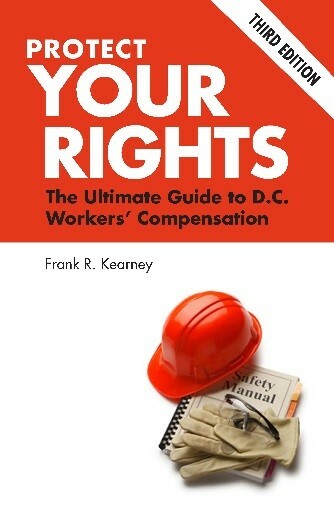 And don't forget to order your FREE book on DC workers' compensation: Protect Your Rights, the Ultimate Guide to DC Workers' Compensation. Get the benefit of twenty years of our experience for no cost or obligation at all!